Jojoba is one of those names I've always struggled to pronounce. It seems I'm not the only one as I've heard a half dozen variations on the word. My talking online dictionary says "hoe-hoe-ba". I like her friendly voice so for that alone I shall santa-esque in my delivery of the word from now on. But how Jojoba is pronounced is not nearly as interesting as the wondrous properties this perennial shrub has. Grown in the South Western USA and North Western Mexico, Native Americans have been utilising Jojoba oil for centuries to heal wounds and skin problems. With antimicrobial properties it actually discourages the growth of bacterial and fungus on the skin. 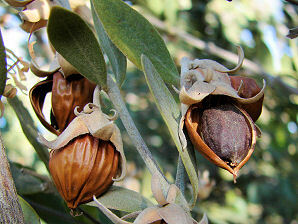 Jojoba also contains vitamins E, B complex vitamins, silicon, chromium, copper, zinc and iodine. Because of it's rich vitamin and mineral content as well as it's other healing properties Jojoba is often used in a wide range of natural beauty and skin care products including cleansers, shampoos, moisturisers, make up and bath products. Unlike other vegetable oils is not actually triglyceride oil but rather a liquid wax. The chemical composition of Jojoba is very similar to our skin's natural sebum so it rarely causes allergic reactions in even very sensitive people. This also means that the skin will easily absorb it. Natural sebum can clog pores whereas jojoba does not. Because they are so similar Jojoba can trick the body into producing less of the natural stuff, which can be useful in treating acne. The oil of Jojoba is also presenting itself as a possible alternative fuel to petroleum. In terms of it's chemical structure it is a very stable oil and has been able to withstand high pressure and high temperatures. It doesn't break down when exposed to water or oxygen. Researchers have also found that in comparison to petroleum based diesel it gives off fewer emissions and causes less engine corrosion. What is the best laundry detergent for sensitive skin? Treat Your Feet & Reap the benefits come summer!